Thank you to all of our colleagues who have helped make us more professional remodelers. The CGR Board of Governors operates the program under the auspices of the Remodelors Council of the National Association of Home Builders (NAHB RC). 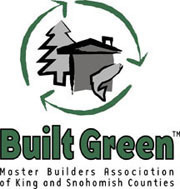 The program confers CGR credentials on those in the remodeling field who meet its prescribed standards of business experience and practices and who complete the program’s educational requirements. In addition to an extensive calendar of seminars and workshops designed to improve remodelers' professional skills, the Remodelors Council administers the Certified Graduate Remodelor (CGR) designation, the most comprehensive professional designation program in the industry. The CGR curriculum emphasizes effective business management as the key to a successful remodeling enterprise, and requires that those certified adhere to a rigorous Code of Ethics as well as recurring re-certification requirements. We're also a member of the professional organizations displayed here. Did you know that Washington is a state with no licensing requirements for contractors? Instead, we have contractor registration, which means that anybody who can afford insurance and a bond can register with the department of Labor and Industries (L&I). We are working with our state builders association to create licensing requirements to "raise the bar". Until that happens, "licensed, bonded and insured" doesn't mean as much as you think. So how do you determine if your contractor is a skilled, experienced professional or a guy with a dog and a truck? Ask if they have any industry designations or if they belong to any industry organizations. We also have links on our "Renovation Resources" page to various sites where you can check up on contractors to see if they are legit. Remember that we also operate Sound Seismic, Seattle's best trained and most professional earthquake retrofit specialist.